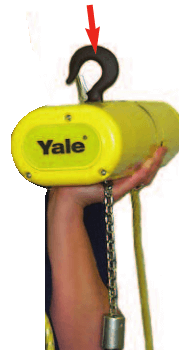 The Yale CPS hoist is a compact and lightweight hoist, it is actually the smallest within the range of Yale electric hoists and is the heaviest model – the CPS 400/2-5 250kg weighing in at just 14kg, and the lightest CPS 110/1-4 125kg model at 12kg. 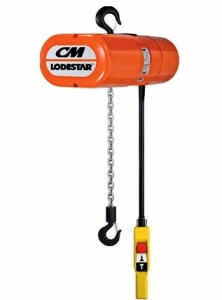 The compact design and its low weight, means that the hoist is easy to handle and move around from place to place. 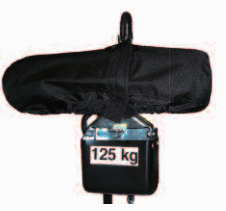 The CPS is ideal for lighter lifting operations with lifting capacities up to 250kg available. With its very low headroom the CPS hoist is commonly used in small industrial locations, construction areas and service companies as well as maintenance tasks. 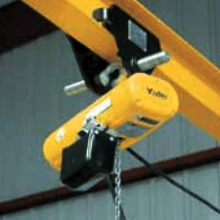 The CPS works great on Mobile Gantry and Jib Crane systems and offers the reliable lifting capabilities associated with the Yale brand. Lifting Hoists Direct are able to supply, repair, inspect and service all Yale hoists at the most cost effective prices. Please find below information on the key features and operational instructions for the CPS. The specifications tab/button will give you all the technical details for each model and the dimensions tab/button will show the complete dimensions in PDF format. If you need any more information please do not hesitate to contact us. Easy to install, use and maintain this rugged little hoist boasts an M4 high duty rating with up to 240 motor starts per hour, and with a 12 month warranty you can be assured of a quality hoist. It is possible to adjust the classification from 1Am / M4 resp. 1 Bm/M3 at 230v by de-rating the duty cycle and capacity, this is only on special request at time of purchase. Overload prevention comes in the form of a slip clutch which not only inhibits overloading scenarios but also extends the working life of the hoist. 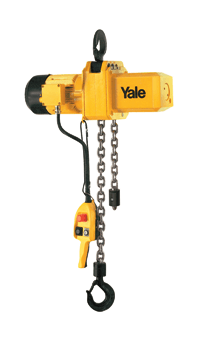 The 5:1 safety factor, safety latched hooks and thermal protection on the hoist duty motor add to the safety of the Yale CPS hoist . Consistently smooth chain operation and speed is due to the lift wheel which has a 10 pocket oblique lay, this also helps to reduce wear of the chain. Precision bearings, lifetime lubricated gear train and electro-magnetic spring pressure break are all standard features of a CPS hoist. The spring-pressure braking system ensures that the load will be safely held even if the power fails. The hoist frame if from a cast aluminium alloy, this is totally enclosed and non-ventilated with its rugged powder coated housing and protects the working components from environmental contaminants and particle ingress. 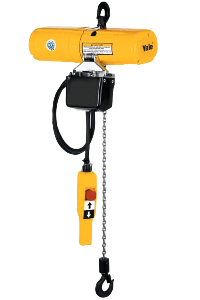 The alloy load chain is chosen for its maximum lifespan and comes complete with a hardened-forged steel swivel hook with a safety latch; 3 metres height of lift comes as standard, let us know if you need extra. A chain stop is incorporated to prevent the chain totally pulling through to its maximum. The top hook also has a safety latch, however it does not swivel; this is to prevent the power cord from getting tangled up. The pendant control cable is 2 metres long as standard and has 2 simple raise and lower push buttons. The pendant controller is protected to IP65, against dust and water ingress. 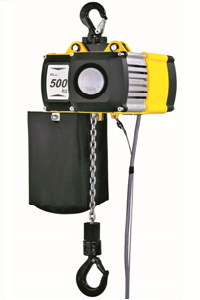 The CPS Hoist is available in 110v, 230v or 400v versions and has a single fall of chain with both the 125kg and the 250kg models. It possesses IP54 rating as standard and has a 48v control voltage. The CPS hoist comes complete with an EC declaration of conformity to state that it complies with all health & safety requirements stated by the EC machinery Directive. We supply two optional extras for the Yale CPS. A chain container which is impact resistant is perfect for keeping the chain safely out of the way. We also have a rain jacket which is perfect for when you are using the CPS outdoors; this ensures protection against the elements which can damage the hoist. The CPS hoist can be attached / suspended from a suitable anchor point such as from a beam clamp or trolley, on a beam structure, or crane. Make sure that the suspension point and structure to which it is fixed has a higher capacity rating than the hoist itself. 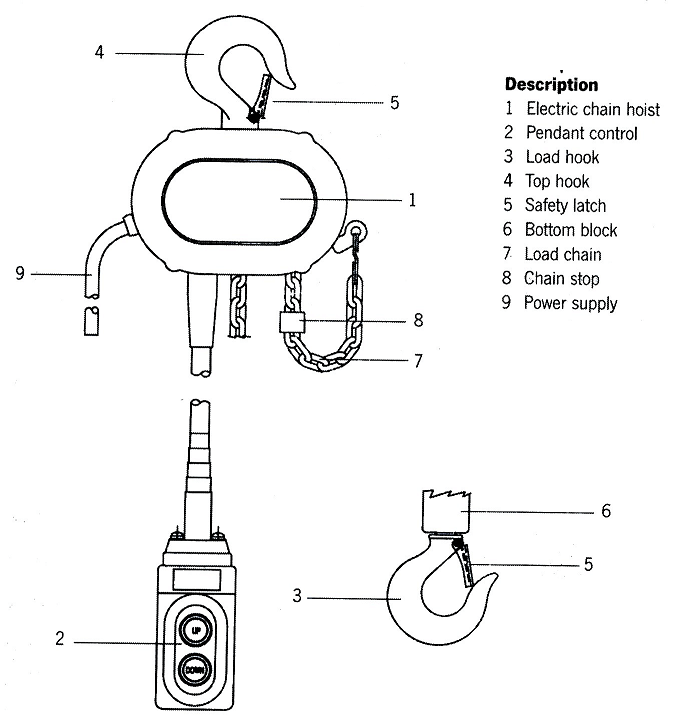 Make sure the safety latch on the top hook re-seats correctly after fitting the hoist to ensure the hoist is secure. The load can then be attached to the lower load hook via your chosen slinging method. When the load is secure – test lift by operating the ‘up’ button a little until the load is clear of the ground, check load stability, re-adjust if necessary and then complete the lift. 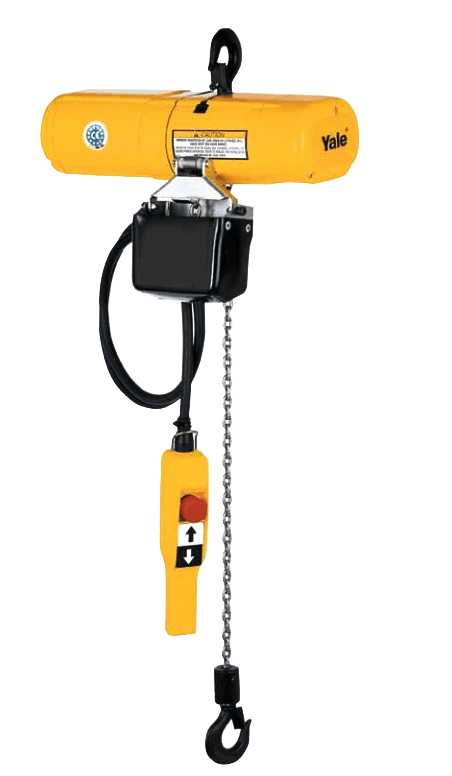 The load can be lowered by pressing the ‘Down’ button on the pendant control, ensure you have a safe and suitable landing area for your load. It is important never to use the upper chain stop or the lower bottom block as chain limiters, they are NOT designed for this action. 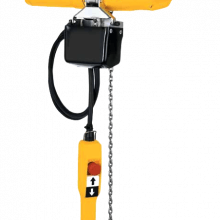 Emergency Stop – In an emergency situation the hoist can be stopped in its tracks by pressing the red emergency stop button on the pendant controller, this does not disconnect the mains power, it just stops all movement of the hoist. To release the hoist to continue with the operation you will need to rotate the emergency stop button in an anti-clockwise direction. The overload protection on the CPS is factory set at 1.6 x its capacity, If you exceed this limit the trigger for the protection device is activated and any further lifting is not possible, lowering the load is still enabled.